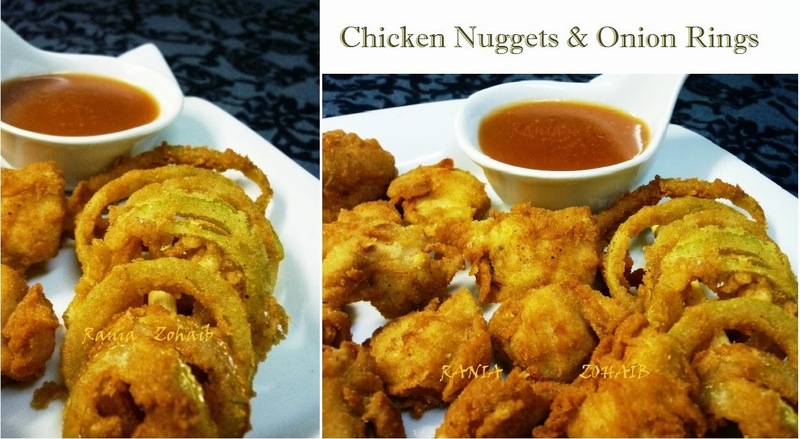 Rania @ Work with sugar'n spice: Chicken Nuggets & Onion Rings the Crispiest way...! The best part of making such snacks at home is that you know what you put in them, it is without any taste enhancer,glutamate,spices whose names you have never heard and above all they are handmade, I love it when they all are not in one shape and size, they are small, thin,thick,round and square. I must say I so enjoyed making them and the first bite of it was like WOW what a crisp!. Of course not to forget my special crumbs I use, have a great part in it, if you remember I told you I use my Rusk crumbs for my coating, as this is light and gives an incredible crisp to fries. The Soda water gives it a light airy structure it is not heavy and this gives the meat a nice crispy layer. We had a cooking competition show here in the Tv where the cook made this batter to fry the prawns. He used the real beer in it, but mentioned that the soda water has the same effect. Since then I use this batter for many things, I made my onion rings in the rest of the batter after I had fried all nuggets. The nuggets stayed crispy quite long at least 3 hours after frying , the onion rings get softer after an hour, so don’t think that they will stay crispy for a life time …lol…. I made the sweet sour sauce with it and i must say it is far far much better than the one you get at any Mcdonald’s or Burger King. It is just a matter of experimenting around. So this is what I did and it is Super!!! Do try, I made it in a very less quantity to test and now I can make it more when needed.